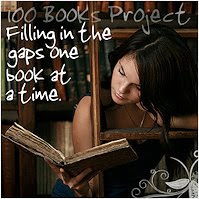 I've posted my list to the Fill in the Gaps Project! Basically, you post a list of 100 book-gaps you have in your reading. You know that list of books that you know you should have read, but haven't yet? Yeah, that list. That's what we're posting. And then you have 5 years to read it. A 75% read rate = success. Off to join...how could I resist?! A five year reading challenge!! OMG. I admire your ambition here, but I'm only signing up for challenges I can do in half a year or less these days.